Step aside cocktail bar, food bars are making their way into the wedding scene. Having various food bars is a great way to have guests customize exactly what they want with all the different options. Couples are able to create personalized menu options that are interactive and fun for guests. From a brunch wedding with a waffle bar or biscuits and jam, to an ice cream sundae bar at the end of the night, the options are endless. Here are some creative ideas of food bars that will make any wedding special! If having customizable potatoes sounds irresistible, the most difficult decision will be to choose if the potatoes should be mashed or baked. This tasty food option is a savory one that is perfect for a wedding or event! Guests could have the option to choose from a variety of toppings such as cheese, sour cream, chives, different meats and sauces, and of course BACON. The next interesting food table that could make a for a memorable night would be a fondue station. This could mean either having a savory cheese fondue selection, having creamy and dreamy chocolate fondues, or both! If you decide to have melted cheese at your wedding then some creative dippers to accompany it would be bread, grapes, apples, crackers, veggies, bacon, or anything that sounds good to you! On the other hand, dippers like graham crackers, marshmallows, brownie bites, rice crispy treats, fresh fruit, or pound cake would be the perfect compliments to the delicious chocolate! Pop! Pop! This inviting sound can be heard as guests munch on this late night snack at your wedding! This is one of the easiest food stations that can be served either hot, or pre-made in advance. Guests could be able to choose from flavors of popcorn such as salted, butter, caramel corn, candy coated, or even unusual flavors such as dill pickle! With the popcorn, fun toppings such as candy, melted butter, salt, cinnamon sugar, caramel, chocolate sauce, and any other sweet or savory topping to satisfy your palate! Another fun option for unique food to serve guests is perfect for an early wedding, or just a southern bride who loves breakfast food! This tasty option can showcase different kinds of biscuits or perhaps maybe even your grandmas homemade waffle recipe. The options are endless for this food bar, and will be one of the most creative ways to eat one of the tastiest early morning treats! Different types of butters, jams, jellies, country ham, bacon, cheese, and more are just some of the many items to jazz up your biscuit. Waffles, Sausage, bacon, grits, hash browns, and even cinnamon rolls can add to this fun food station! One of the more popular yet fun food stations to have at a wedding would be a sushi station. This is perfect for a couple who loves to travel and wants to incorporate cultural aspects into a wedding, or just loves some sushi! As a couple, you could choose your favorite sushi rolls for guests to munch on with soy sauce, ginger, and wasabi. To make this an even more interactive station, you could have a sushi roller actually preparing the sushi in front of the guests rather than having it pre made. 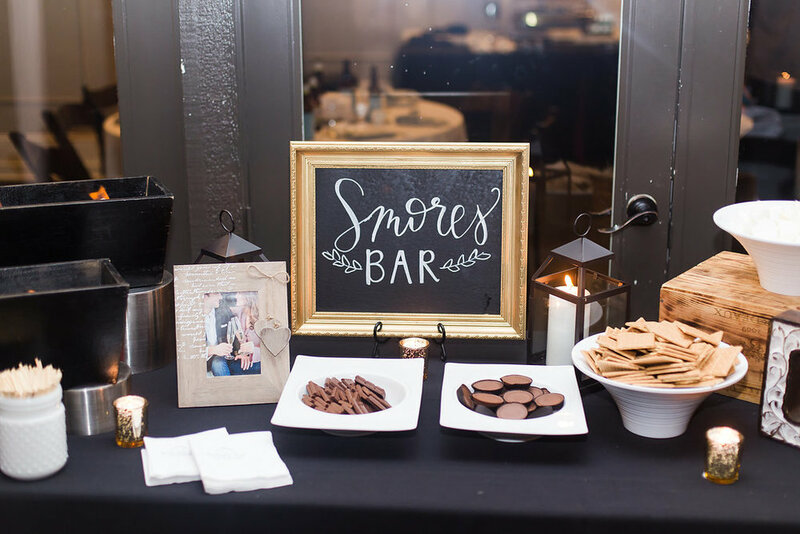 Last but not least, a s'mores bar is the perfect way to wrap up the end of a wedding on a summer's night by a fire, or to warm you up on a chilly night in the fall! These desserts are such a classic, but can easily be twisted up to accommodate different palates! The traditional graham cracker, chocolate, and marshmallow is a must, but other combinations with Reese's peanut butter cups for the chocolate, shortbread cookies with fruit and a marshmallow, or Nutella and strawberries between two chocolate graham crackers make for the perfect sweet treat!